A parliamentary report of 1777 recorded parish workhouses in operation in Downham Market (for up to 20 inmates) and Stow Bardolph (20 inmates). DOWNHAM is a small market town. The Poor are partly farmed. The contractor has the use of 4 acres of land and a Workhouse, in which he maintains such Poor as the parish send him, finding beds and clothing when they go into the house, but the farmer provides clothing during their residence with him. He is paid £95 a year, provided the number does not exceed 20, and for all above that number 2s. a week each. He is entitled to their earnings ; they are employed in spinning jersey or worsted. One man weaves hemp cloth. At present (June, 1795) there are 26 inmates, viz., 7 under 9 years, 4 from 9 to 20, the rest from 25 to 70. There are 4 bastards and 3 soldiers' wives. The officers give weekly allowances to such Poor as can support themselves upon a less sum than what is charged by the master of the Poor-house. Prices of provisions nearly the same as in Lincolnshire, but the wages of agricultural labour are much lower. Wimbotsham had a workhouse that also served the parishes of Stow Bardolph, Stradsett, and Tottenhill. Two cottages, built on the waste by the overseers, were occupied by poor widows. County of Norfolk: Barton Bendish, Bexwell, Boughton, Crimplesham, Denver, Downham Market (2), Fincham, Fordham, Hilgay, Marham, Roxham, Holme next Runcton, Ryston, Shouldham, Shouldham Thorpe, Southery, South Runcton, Stoke Ferry, Stow Bardolph, Stradsett, Tottenhill, Wallington with Thorpland, Watlington, Welney, Wereham, West Dereham, Wiggenhall - St German's, Wiggenhall - St Mary, Wiggenhall - St Mary Magdalen, Wiggenhall - St Peter, Wimbotsham, Wormegay, Wretton. Later Additions: West Welney (from 1895), Downham West (from 1894). The population falling within the Union at the 1831 census had been 16,016 with parishes ranging in size from Ryston (population 26) to Downham Market (2,198). The average annual poor-rate expenditure for the period 1833-35 had been £11,083 or 13s.10d. per head of the population. Downham Union workhouse was built in 1836 at the south side of Howdale Road in Downham Market. The Poor Law Commissioners authorised an expenditure of £4,260 on construction of the building which was intended to accommodate up to 250 inmates. 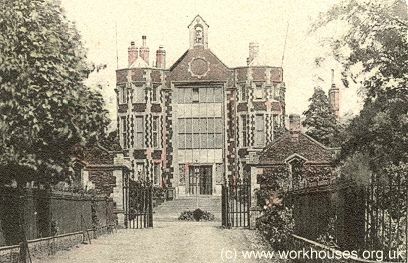 The workhouse was designed by William J Donthorn who was the architect of other Norfolk workhouses at Aylsham, Erpingham, Freebridge Lynn, Swaffham, and Ely. 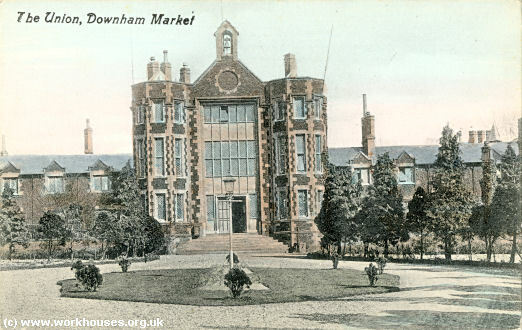 Like Ely, Donthorn's design for Downham was loosely based on the popular cruciform layout but with shortened wings at the front of the building to the west. The workhouse location and layout are shown on the 1885 map below. In 1894, the British Medical Journal set up a "commission" to investigate conditions in provincial workhouses and their infirmaries. Following a visit to the Downham establishment, the commission's report sympathised with the Board of Guardians over the "unmanageable structure" which served as the infirmary but suggested that the sick might be housed in some other part of the workhouse, which was genereally little more than a quarter full. Amongst there other suggestions was that the sole and untrained nurse would benefit considerably from even a modest amount of formal training. Further details are available in the full report. THE UNION WORKHOUSE.—On Tuesday, Oct. 27th, Mr. and Mrs. South's lengthened period of office (upwards of 23 years) as master and matron of the Downham Union Workhouse, came to an end, and they have retired into private life, followed by the earnest wish of many of their friends that they may long be spared to enjoy that repose and freedom from pare which they have so worthily earned, but which have been hitherto denied them by the exigencies of their position. Very few persons have any conception of the extremely difficult and arduous nature of the duties of a workhouse master and matron ; duties which demand for their proper fulfilment the exercise of qualities of heart and head not possessed by every one, and these indispensable qualities Mr. & Mrs. South displayed in their fullest degree. Whilst maintaining their position as heads of the establishment with dignity and firmness, those unfortunate ones confided to their care were invariably treated with the utmost kindness and consideration, and taught to regard the master and matron as their friends. This kindness and consideration was repaid in every case with the respect, and, in a great many cases, with the love, of those upon whom it was bestowed. On the last day of their stay in the Workhouse a pleasant little surprise awaited Mr. and Mrs. South in the shape of a presentation from the subordinate officers, consisting of a silver-plated sugar bowl and cream jug, accompanied by a letter expressing regret at their departure, and wishing them health and happiness. Mr. and Mrs. South have also been the recipients of other parting gifts. The new master and matron are Mr. and Mrs. Clark, from the Lynn Workhouse. 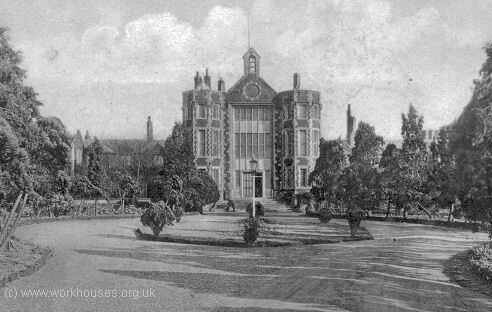 The Downham workhouse buildings no longer exist and the site is now occupied by a care home for the elderly. 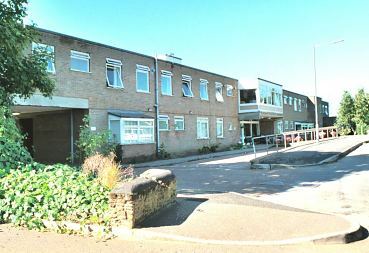 Downham Market former workhouse site from the north-east, 2001. Norfolk Record Office, The Archive Centre, Martineau Lane, Norwich NR1 2DQ. Holdings include: Guardians' minute books (1836-1930); Admissions and discharges (1905-8, 1911-16); Vaccination registers (1899-21); etc. Elizabeth Howard's online history of Downham Union workhouse.